When you need meticulous, dependable, and complete cleaning services for your business location, look no further than the experts at Prestige Janitorial Services. Our diligent, highly experienced team of cleaning professionals work with speed and precision, using the most powerful and efficient cleaning equipment and methods. With a wide range of services and specialties, we keep your facility looking fresh and inviting at all times! To receive a free estimate for our services, contact us today. Our team looks forward to serving yours! As a business owner, it’s crucial that you create and maintain a safe, hygienic, and welcoming location. Both your clients and your staff will notice and appreciate these steps. Most busy professionals simply don’t have the time, energy, or resources to give their business location the attention it needs. There are multiple advantages to choosing Prestige Janitorial Services for your commercial cleaning needs. The aesthetic element of cleanliness is just the beginning. As commercial spaces see large amounts of traffic, accumulations can show in carpets and surfaces. There’s also a constant buildup of bacteria and spreadable viruses. 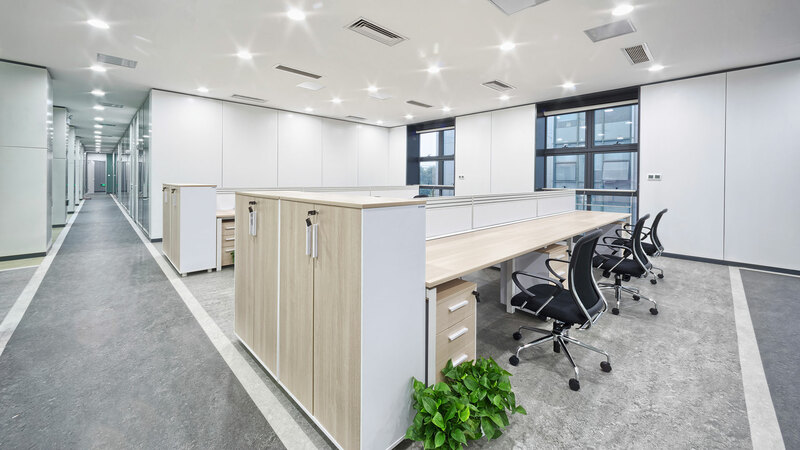 By regularly sanitizing and cleaning your business space, you offer a healthier environment which translates into fewer sick days and greater productivity. We use the most powerful cleaning methods to ensure a long-lasting, effective clean. Our products are prepared with environmental sustainability in mind, using green solutions and materials whenever possible. Though our products are extremely powerful, you can be confident they are safe to use within your space. We can set up a regular commercial cleaning schedule, keeping your facility looking and feeling fantastic, at all moments. When we arrive at your business location, we’ll have all the equipment and resources for the highest standard of cleaning excellence. We service a complete range of commercial and industrial spaces, including office buildings, medical and dental clinics, restaurants, schools, banks, churches, gyms, and more. We have the right products to target each aspect of your facility’s interior. We diligently clean and sanitize all surfaces, appliances, and fixtures in the kitchen or bathrooms. Our floor cleaning routine is suited to all types of carpets, tiles, and other materials. We also offer window and glass cleaning, leaving a streak free shine every time. Regardless of your janitorial or commercial cleaning needs, the company to call is Prestige Janitorial Services! For many years, business owners in the Irving area have depended on us to keep their businesses looking fresh and inviting at all times. A variety of businesses choose to set up regularly scheduled cleaning services. No matter the nature or size of your facility, you can count on our commercial cleaning specialists to keep your location in good order. We tailor our service offerings to those that you need most. Our attention to detail is unmatched, and we leave no aspects overlooked. For janitorial services your business can depend on, contact us today! 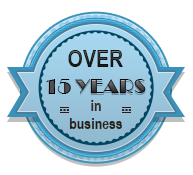 Serving Irving for more than 15 years, our goal at Prestige Janitorial Services is to provide every one of our commercial clients with reliable, high-quality and cost-effective cleaning that fits your schedule. Dedicated to the work we do, we believe that commercial cleaning is an essential part of any busy structure. 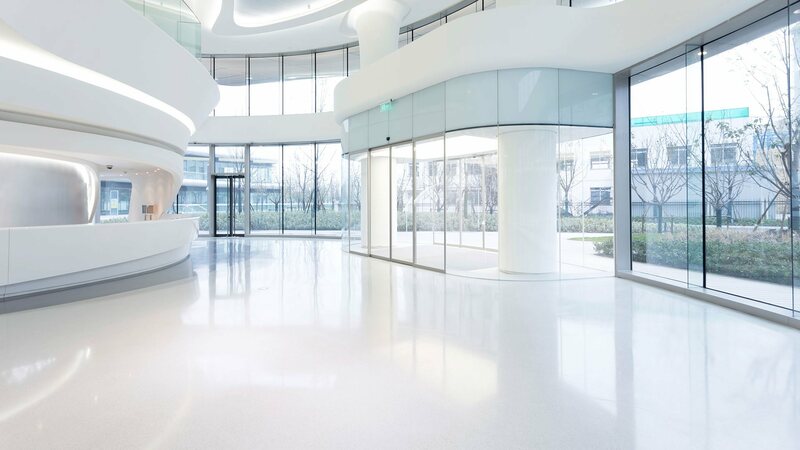 When it comes to representing yourself properly, a clean commercial or industrial space will give the right first impression every time. Whether you’re looking for a one time “spring clean”, post-construction cleanup, or regular services, Prestige Janitorial Services can handle any job, big or small. Give us a call today to see what we can do for your company! In over a decade of work in Irving’s commercial cleaning industry, we’ve cleaned everything from veterinary offices to high-rise apartment buildings. If you’re a building or company owner, you know that the space you own and/or work in is more enjoyable to be in when it’s clean. You as well as your tenants, employees or clients will all benefit from sparkling bathrooms, floors and countertops. Depending on your commercial cleaning needs, we’ll send a small or large crew to get your space looking cleaner than ever! We have all the knowledge and equipment for power washing, window washing, blind cleaning, carpet cleaning, upholstery cleaning, stripping, waxing, tile and grout cleaning, and more. When it comes to commercial cleaning services, Prestige Janitorial Services understands that a different approach needs to be taken with every building variety and business type. Our retail cleaning services are highly customizable to cover absolutely everything you could want cleaned in your retail space! We’ll work in all the basics in our cleaning estimate such as the cleaning of floors and carpeting, window cleaning, restroom disinfection, and extensive dusting of displays and lighting. From there, we will discuss with you any additional cleaning services that will be necessary! For example, not all retail spaces have kitchen areas but for those that do, we’ll incorporate thorough kitchen sanitization from microwave and fridge interior scrubbing to organization of cupboards and more! Every retail business in Irving is unique and by working with Prestige Janitorial Services you’ll ensure that your business has the personalized janitorial services it deserves. For business owners in Irving who are concerned about their impact on the planet, now you can keep up your commitment to eco-friendliness where your janitorial services are concerned as well! There are a lot of reasons to invest in green office cleaning services. Your business will be a healthier place to work in due to the lack of chemicals floating around, meaning your employees will be healthier and take less sick days. Environmentally friendly cleaning products are often more affordable as well. Want to find out what we use at Prestige Janitorial Services and how these products can make your office cleaner than ever? Give us a call and ask! Once a large-scale construction project is completed, it’s time to get the site all cleaned and ready for use. You’re not going to get the construction crews to do it. They’ve spent their energy and talent in the construction process. It’s time to bring in an expert team of janitorial professionals like Prestige Janitorial Services. We’ll clean up any remaining debris that might be laying around. If there are hazardous chemicals, we’ll dispose of them safely. We’ll get rid of the dust, the dirt, the wood chips, the glue, the nails, the screws, the fittings, the discarded, and the unused components. Once we’re done we’ll put the finishing touches on your construction project so that the whole place is gleaming and spotless for the big reveal! Industrial sites and production facilities create their own brand of waste. In most cases, the only way to get rid of it is with a qualified removal crew that’s trained on proper techniques. In Irving, Prestige Janitorial Services offers industrial cleanup for government and private facilities. Everyone on our team is trained in proper waste disposal protocols so that you can be sure that it’s done safely and with adequate care. And since our crew is insured, bonded, and certified to do industrial cleanup, we take on the full liability for our work. Many restaurant and bar owners get their staff to clean up after closing. And while this might be a good way to save money, it’s not a good way to get your restaurant clean. Food preparation is not something to be taken lightly. One sick customer and you might be saying goodbye to your beloved business. Book our services for daily, weekly, monthly, or bi-annual visits. And rest easy knowing that the health and safety of your customers is in good (clean) hands. Hospitals, dental clinics, and other medical offices require a specialized cleaning service that’s tailored to the specific requirements of the institution. It’s not possible to hire any old janitorial company. Commercial janitors who are trained to clean schools or offices will not have the skills necessary to properly clean a hospital or dental clinic. At Prestige Janitorial Services, we have specific teams devoted to the specialized services that hospitals and medical facilities require. That means dealing with bio-hazards, dangerous objects, and other sensitive waste. It also means achieving an exceptionally high level of sanitation. The only way to ensure that your medical facility reaches the highest standards of cleanliness is with a medical janitorial team. As the most qualified hospital cleaning team in Irving, Prestige Janitorial Services is the region’s number one choice! Don’t opt for second best. Get the pros on the job. Started by our family back in 2002, at Prestige Janitorial Services, you’ll get the personal touch every time. While our team has grown, we haven’t lost our attention to detail and investment in every client, new and old. We believe in the work we do, and love being able to help your commercial space look its best with our cleaning services. In comparison to organizing a schedule among your colleagues or coworkers, investing in a professional janitorial service means that you will receive a team that invest the time, money and effort needed to be successful. In turn, this will see better results for your business. The fact of the matter is that many janitorial companies, like ours at Prestige Janitorial Services, are passionate about what we do. Our office cleaning company is focused on maintaining and increasing the standard of care in this respect as their quality of work is assessed every single day. On top of that, our cleaning staff is not your responsibility but is rather the responsibility of the cleaning company, thereby saving you the liability and worry of other concerns regarding the management of additional staff. Staff availability is one of the other major advantages of choosing a professional janitorial service. By going pro, the issue of holidays, leave of absences and other attendance-related concerns. Contacting an external cleaning company means that you never have to worry about an unreliable service or an inferior in-house work schedule. If you are concerned about health and hygiene, then you really need to go pro. At Prestige Janitorial Services, we spend time and money on safety training and have the highest standards of cleanliness integrated into everything we do. Our commitment to quality at all times and we will not be beaten for price or efficiency. When you hire an office-cleaning company, they will stay up to date with the best products and cleaning equipment. At Prestige Janitorial Services, we use only the most innovative and effective cleaning equipment available and will always do our utmost to make sure that your company’s cleaning needs are met. By choosing Prestige Janitorial Services as your cleaning team of choice, you can be guaranteed that we will be able to modify our service to best meet your business’s needs. On top of that, we can customize a cleaning schedule to fit your company’s needs. Adjusting the frequency and schedule of your company’s cleaning allows business’s just like yours to scale up or scale down the amount of cleaning in your office depending upon your needs. If you need more cleaning, you can make a phone call to achieve this—you do not need to hire additional staff. Finally, you can save money on maintenance, equipment, uniforms, and inventory. It’s not your core business so is it really where you want to spend your time? We’re available at all hours of the day or night to check out your commercial space and provide you with a free quote for services. At Prestige Janitorial Services, we believe in honest and transparency. Once we begin our work together, you’ll never see any surprise fees pop up on your bill! Cleanliness is a necessity, and because of that, we offer the most competitive rates around so that you don’t have to break the bank to get the job done. You can count on Prestige Janitorial Services to get the job done right, on time, every time. We work with all areas of commercial cleaning and have cleaned hundreds of commercial spaces in the Irving area in our 15+ years in the industry. Always improving our techniques and keeping our prices competitive, this family-owned and operated company truly believes in customer satisfaction and is dedicated to the work they do. When you call or email us, we can get an idea of what your requirements are pretty quickly, but if you require an on-site visit, we’re happy to come by and give you a free estimate of our services. Get in touch today and let’s get started!